"We're what's known in common parlance as peculiar." That quote is from Eva Green in Miss Peregrine's Home for Peculiar Children, an absolutely brilliant film. The film is based on the book of the same name by Ransom Riggs. 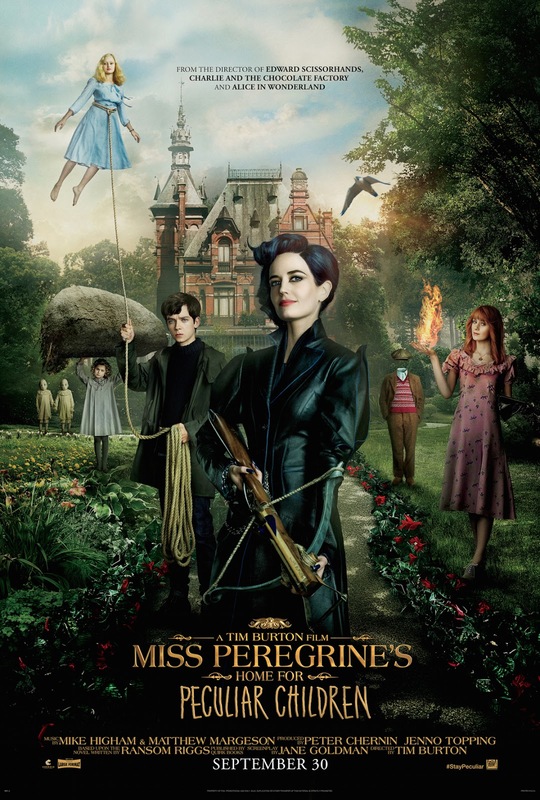 Green plays Miss Alma LeFay Peregrine, the headmistress of the titular home for peculiars, children who have special powers. The children are: Emma (played by Ella Purnell), who can control air; Enoch (played by Finlay MacMillan), who can resurrect the dead; Olive (played by Lauren McCrostie), who is pyrokinetic; Millard (played by Cameron King), who is invisible); Fiona (played by Georgia Pemberton), who can control plants; Bronwyn (played by Pixie Davies), who has super-strength; Horace (played by Hayden Keeler-Stone), who has prophetic dreams; Hugh (played by Milo Parker), who has bees in his stomach; Claire (played by Raffiella Chapman), who has an extra mouth hidden behind her head; & the Twins (played by Joseph & Thomas Odwell), who are two masked gorgons. The home is located on the Welsh island of Cairnholm, stuck in a time loop on Friday, September 3, 1943, the day the home was bombed by the Nazis; however, they live forever by re-living the past 24 hours. In 2016, young Florida teenager Jake Portman (played by Asa Butterfield), witnesses the death of his grandfather, Abe (played by Terence Stamp), who before his death, tells Jake to find the bird, the loop, & September 3, 1943. Determined to find out what this means, & after gaining more clues from his aunt, Jake, along with his father Franklin (played by Chris O'Dowd), travel to Cairnholm. While there, Jake enters the loop & meets the peculiars. Jake becomes attracted to Emma, & learns more about the peculiars. He learns that a group of peculiars, called Hollowgasts, led by Barron (played by Samuel L. Jackson), are after peculiars called Ymbrynes, like Miss Peregrine. They kidnap Ymbrynes & eat the eyes of their children to regain humanity. They must now defend themselves against the Hollowgasts, & also try to stay in the time loop. The cast, especially Green & Butterfield, were great. Tim Burton's direction is absolutely astounding, proving that he is an absolutely visionary director. The screenplay from Jane Goldman is great. But the best things about this movie are the costume design, editing, production design, & cinematography. The costume design by Colleen Atwood is absolutely amazing. The editing from Chris Lebenzon is excellent. The production design from Gavin Bocquet is absolutely wondrous, as it is with all of Tim Burton's films. And the cinematography from Bruno Delbonnel is astounding. This is one of Tim Burton's best films.